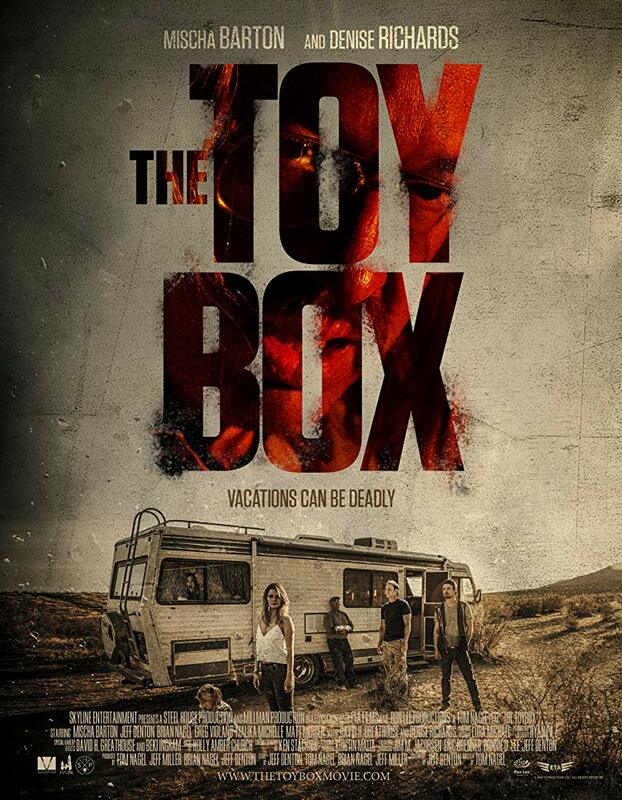 THE TOYBOX is your second feature length film that you directed (the first being CLOWNTOWN in 2016). What did you learn going from short films then onto feature length films? Going from short films to features is a whole other ballgame. I learned so much on Clowntown it was incredible. Plus I was involved from creating the story to delivering the film. I feel like as a director you should really try to be involved in the whole process at least once. The knowledge you gain is invaluable. How did THE TOYBOX compare to your time on CLOWNTOWN? I definitely felt more prepared on The ToyBox especially with pre-production. But The ToyBox was a whole new challenge with working out in the desert for so long. Dealing with the elements was big challenge in itself. Plus The ToyBox was the first time working with bigger name actors in Mischa and Denise. I am lucky they were both great and it was a positive experience. With your new film THE TOYBOX it shows you had several influences going into it. For those who are unaware, what were your influences on this project and how did they effect the story going forward? After we came up with the road trip/RV idea we quickly found out about the “real” toybox killer and it definitely inspired us for sure. We just ultimately did not want to do a “based on” story or call it inspired by. But I can say that reading about him definitely inspired some of our ideas. And Jeff Denton really breathed life into the story. How did you get Mischa Barton and Denise Richards to sign up for the project and how was they to work with? We reached out to both of them and what really got them to sign on was the script. It was my first time dealing with star actors and there was definitely a process, but it really wasn’t too bad. And like I said I think ultimately they wanted to do it because they believed in the script. Do you have anybody in the film industry you would like to work with given the chance? That’s a touch one. There are so many talented people in the industry that inspire me and I know could learn from. I think if I had to pick just one though, I would have to say I would love to shadow Steven Spielberg during a film. I think that would be incredible. If you could get to work on any major horror franchise (e.g. FRIDAY THE 13TH) which one would it be and why? A Nightmare On Elm Street...hands down! You have done many things in the film industry but which one has been the one you have loved doing the most? Acting will always be a love of mine. But as I have grown in my career, I feel like Directing is where I am the most comfortable. I have really just come to love directing. I just enjoy working on the whole process of filmmaking and directing gives me a chance to be a part of it all. For any budding filmmakers out there what advice would you give them? Just shoot. I feel a lot of filmmakers have a script of idea but its too big and they wait around trying to get it made. Take a look around at what you could do right now and do it. Even if you just have a camera on your phone...Just start shooting and telling stories. With THE TOYBOX all wrapped up, what is next for Tom Nagel? We have a few scripts we are going through right now. I can not say any names yet, but I am definitely already starting to figure out what's next. Thank you Tom for your your time and good luck with your future projects.